Happy birthday Codey & Kyle! 25 years ago at 12:04 a.m. my life changed forever. My dreams for those 2 blonde-haired, blue-eyed boys would never come to be. I arrived in Holland. 25 years ago, this week was one of the hardest I would ever go through. I gave birth to twins at 29 weeks, Codey & Kyle (2lbs 7oz & 3lbs 8oz). Codey has had one of the hardest lives I have ever seen. He’s spent close to 5 years in the hospital. He has had close to 100 surgeries. He is a fighter. He is the sweetest, funniest, most loving child around. His life made me grow up quickly but his life changed everything about mine. Kyle may have lived only 5 days, but his life changed me too. He made me appreciate every moment I have, to never take things for granted, to not fear death. Yes, I know Codey won’t see this, but I am proud of my boy who was told on numerous occasions that he wouldn’t make it. We lost count of the times doctors told us to call family down because he wouldn’t make it through the night. We were told that he would be blind, deaf, and in a vegetative state. Many would see his life as sad, but I see it as a miracle. I am happy every day that he is here with me. Plus, I never get to celebrate Kyle. Many times I don’t even get to say I have 8 children because it just takes to long to explain it. I love it when someone at a store asks me because I can proudly say I have 8 children and know that they won’t ask me more. Thank you for letting me celebrate this day! I can’t believe it has been 25 years already. I remember when I could barely stand the thought of how long it would be before I got to see Kyle again and now I’m 25 years closer. Happy birthday boys! Mama loves you! I’ve been thinking about and praying for all the people out there who are trying to decide about adoption. There are many kids just waiting for a forever family. I’ve been thinking about sharing this prayer, asking you to pray too, and thought it was just too vague. But one of my devotionals this morning included this verse: You cannot keep yourself from talking about what you care about most. Jesus said, “A man’s heart determines his speech” (Matthew 12:34 LB). Please pray for all those families trying to decide on a specific child and all those families trying to decide if it is the right thing for them. Pray for all those children out there (estimates range from 100 to 150 million children) just hoping & waiting for a forever family. Adoption is a wonderful thing. If God has placed this on your heart, please don’t dismiss it. Trust in His plan and proceed. This has truly been the most amazing day. The ENT office called and after fighting with our insurance company, making a billion calls, and talking with the BAHA people, they decided to let us have a loaner. We went in and they placed it on her head. 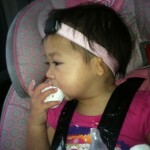 The processor (hearing aid) clips onto this little pink headband ($160 headband). We will leave my medical complaints until another day because today is too wonderful. They turned it to the lowest setting and we said her name. She proceeded to cry and laid her head on my shoulder and just sobbed. BUT THEN Dan said, “I love you Maisey” and she figured out what was going on. They slowly turned it up while we played with many noise making toys to see if anything upset her. She did great. Nothing really stressed her out. When we walked out of the office, she heard a bunch of cars on the interstate. The office is right by Interstate 235. She just stopped and her little mouth dropped and she pointed at the cars. She kept pointing and looking and me and pointing some more and smiling really big. It was the best moment. Truly the best. Then she heard a bird and her head turned straight towards the sound and she laughed. 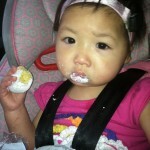 We celebrated with a stop at a local convenience store to grab her favorite powdered sugar donuts. She placed one in each hand and celebrated with great gusto. 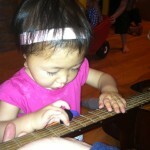 We went home and she played the guitar and was so happy. 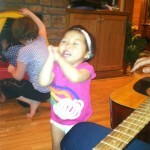 We played music on the I-phone and she danced and sang. Tonight when she took her bath we had to take off the headband. She was so upset and she usually loves her bath. She kept pointing at her headband and signing please. She hasn’t touched her headband all day long. It fell down to her neck once and she signed please to have it put back on. I think it is official my girl likes to hear. This mommy is one unbelievably happy and blessed mommy. What a wonderful thing to get to be a part of. Praise God! Dan and I just read “House of Hope” about the foster home that Maisey was in while in China. The book actually mentions her because she was their 1000th baby treated. Maisey was taken out of her orphanage by this group because the orphanage couldn’t get her to eat and she was in the group of children who weren’t thriving. Mrs. Hill who runs the Hope House Foundation took Maisey in. Many of the children they take in die or are too sick to ever get on an adoption list but Maisey, with their help, put on weight and got well enough to put on the adoption list. Plus, on top of that children with lethal/terminal conditions are not supposed to ever get placed on adoption lists, yet Benjamin did. It brings me to tears to think of him alone in an orphanage. I thank God daily that somehow He got Benjamin on that list. I can’t imagine Benji dying alone. Both of these children are beyond sweet. They are kind and loving and so adorable. They laugh all the time and just enjoy life. I am so blessed to get to be their mama and feeling even more blessed after all that I have learned in the last few days. God is good and He watched out for my little ones. I know everyone keeps saying Benjamin & Maisey won the lottery, but truly it was me who won. Everyone says “By the grace of God. I understand that and I get that, but what about all the kids that are left in the orphanages. Does God not care about those children? What if your child is sick? What if you are the parent whose child isn’t saved? Did you just not pray hard enough. Does God just not care enough? How can you put together the thought of a loving God, an all knowing God and an imperfect world? I have 2 beautiful orphans who were saved. There are 10,000 orphans leaving China every year. But what about the other 800 orphanages in China alone? Does God not see those orphans? Does God not care? What about the child who is imperfect and no one sees their worth? People talk about the chosen, the called, where does that leave the rest of us? My head is just spinning with these questions and what I can do about it. Just so anyone reading this understands. I am not questioning God’s sovereignty. I understand His ways are not my ways. I accept that His plan is perfect and I trust it with all my heart. I know that man is evil and self-centered and that we have free will. I just wish it wasn’t so. I love what the Hills have done. If you haven’t read any of it yet, look up www.hopefosterhome.com . It is absolutely amazing. The book “The House of Hope” was wonderful. Mr. and Mrs. Hill talk about trusting God. They say you just have to get in the river and trust that God will lead you were you need to go. AMAZING! They also talk about the starfish story. Many have probably heard this one. A gentleman is standing on the beach throwing starfish back in, one at a time. Another gentlemen stands there looking at the beach covered in starfish and asks the other gentlemen why he is even trying because there is no way he can save them all. The first gentlemen says, “I know, but it matters to this one” as he throws another starfish back into the water. One orphan at a time. I keep saying it over and over again in my head. I’ve heard it said that there is an orphan for every 10th Christian in the world. Why are we not opening our homes and our hearts? That last statistic I read says there are 125,000 children waiting to be adopted in the U.S. and there are 300,000 churches. That’s not even 1 child per church. I don’t know what to do with all these thoughts that I am having. I know adoption isn’t for everyone, but there are so many other things we can do. Now there are organizations that allow you to sponsor an orphan for only $30 a month. Donate to someone who is trying to adopt. There are so many ways to help. My heart just breaks for these orphans here in the U.S. and around the world. I have 3 children, who were abandoned, and they are the sweetest kids you could ever find. I know not everyone can adopt, but if the thought has crossed your mind – don’t be fearful. God provides. God will find a way. If the thought is placed on your heart, give it careful consideration. Don’t automatically think “it’s too expensive” or “I just couldn’t do that”. You’d be amazed at what you can do with God on your side. Maisey update – Saw ENT today they are assuming she hears at 60 decibels. Normal talking is about 40 decibels. They are ordering her BAHA. PRAISE THE LORD! On a sidenote: Maisey is in a book “The House of Hope” on page 216, they talk about their 1,000th baby helped and it was Maisey. They called her Chaya while she was there. Dan and I have been praying about what group to help. I didn’t feel I could start my own foundation. I just don’t have enough time or truly feel that is the right thing to do. We both feel very pulled to help orphans. Every since we decided to adopt Maisey, God has placed something on our hearts. We just couldn’t pinpoint what it was. It is interesting to me that the most painful thing I’ve ever gone through has placed me in the position I am in today. Living through Kyle’s death and fully trusting in the Lord’s plan for Kyle’s life allowed me to open my heart to a child/children with a shortened life span. I realized this with Hope, when we decided to take a chance. I felt it even more with Benjamin. I knew he was my son and I would go through anything for him – just from seeing his picture. Kyle’s death taught me many life changing lessons. Every day is a blessing. Every moment is to be treasured. Don’t take things for granted. Don’t assume people know you love them. Trust in the Lord! Pretty big lessons from a little boy that lived only 5 days. When we got back from China I felt something was still missing. I am supposed to do more. Over and over again I dreamt that my life is about to change. I remember thinking I thought my life had already changed. But I know there is supposed to be more. Am I supposed to adopt again? Am I supposed to support some group. Should I sponsor some orphans through Show Hope. Should we pay for surgeries? What is God asking me to do? I dreamt that I couldn’t find 4 of the 6 children that I adopted from China. I woke up frantic and in tears. I think that one freaked Dan out a bit. Cassie joked that we were like Noah’s ark. 🙂 I keep praying that God will make my path clear. That He will show me what I am supposed to do. Our house is chaotic, it’s a mess, there have been blood draws and doctor appointments – why do I feel like there should be more. It doesn’t make sense yet I feel it to my core. God is calling. I wanted something I felt a personal connection to and here it is. The Chapman’s and Show Hope obviously have a special place in my heart. It was Mary Beth’s fault I had adopted in the first place. lol Actually, her daughter’s quote about is it better for an orphan to have an older mother or no mother at all was the final deciding factor for me. I had been dragging my feet thinking I was to old to adopt and then I read her book and God slapped me up along side the head. I’m sure He gets tired of doing that. But I wanted something I felt a true personal connection to. And then it happened. I love how God works. I just happened to send a Facebook message to Show Hope thanking them for all their volunteers. There were tons of posts that day. Why did Cathy respond to my post? Cathy looked into it and found out that Maisey was one of their kids. She asked me to let them know when we get her home so they can celebrate another forever family. I send them a picture and they send me the newsletter stating Maisey was the 1,000th baby helped. Someone just happened to remember she was in the November 2010 newsletter. Dan reads about the New Hope Foundation in China on line and he orders the book about the House of Hope and turns directly to page 216 and their is our little Maisey’s name. These people, the Hills, take in the sickest kids and try to bring them to health. Their vision is “To comfort always, to relieve often, and to save sometimes.” A place after my own heart. I will continue to pray for God’s leading, but I can tell this one is gonna be big. I wonder what He is asking me to do. I’ve been thinking about this a lot….how stay at home mom’s are looked down upon but change it to caring for an orphan & suddenly it’s this much bigger thing. Saving orphans is a wonderful thing and God calls us to do this, but remember a child is a child in God’s eyes. So do everything as unto the Lord. Your work is important. Those who are allowed the luxury of staying at home, glamorize work while those at work, envy the time those at home have with their children. It’s the whole grass is always greener thing. This isn’t meant to criticize anyone. I just wanted to share this article because it hit home for me. This same principle certainly applies to mission fields too. The closer you get to home, the less intriguing the work of sacrifice seems. As someone once said, “Everyone wants to save the world, but no one wants to help Mom with the dishes.” When you are a mother at home with your children, the church is not clamoring for monthly ministry updates. When you talk to other believers, there is not any kind of awe about what you are sacrificing for the gospel. People are not pressing you for needs you might have, how they can pray for you. It does not feel intriguing, or glamorous. Your work is normal, because it is as close to home as you can possibly be. You have actually gone so far as to become home. If you are a Christian woman who loves the Lord, the gospel is important to you. It is easy to become discouraged, thinking that the work you are doing does not matter much. If you were really doing something for Christ you would be out there, somewhere else, doing it. Even if you have a great perspective on your role in the kingdom, it is easy to lose sight of it in the mismatched socks, in the morning sickness, in the dirty dishes. It is easy to confuse intrigue with value, and begin viewing yourself as the least valuable part of the Church. There are a number of ways in which mothers need to study their own roles, and begin to see them, not as boring and inconsequential, but as home, the headwaters of missions. If you are like me, then you may be thinking “What did I ever give up for them? A desk job? Time at the gym? Extra spending money? My twenty- year- old figure? Some sleep?” Doesn’t seem like much when you put it next to the work of some of the great missionaries, people who gave their lives for the gospel. Think about the feeding of the five thousand when the disciples went out and rounded up the food that was available. It wasn’t much. Some loaves. Some fish. Think of some woman pulling her fish out and handing it to one of the disciples. That had to have felt like a small offering. But the important thing about those loaves and those fishes was not how big they were when they were given, it was about whose hands they were given into. In the hands of the Lord, that offering was sufficient. It was more than sufficient. There were leftovers. Given in faith, even a small offering becomes great. But I’d like to challenge you to look at it differently. Giving up what you cannot keep does not mean giving up your home, or your job so you can go serve somewhere else. It is giving up yourself. Lay yourself down. Sacrifice yourself here, now. Cheerfully wipe the nose for the fiftieth time today. Make dinner again for the people who don’t like the green beans. Laugh when your plans are thwarted by a vomiting child. Lay yourself down for the people here with you, the people who annoy you, the people who get in your way, the people who take up so much of your time that you can’t read anymore. Rejoice in them. Sacrifice for them. Gain that which you cannot lose in them. It is easy to think you have a heart for orphans on the other side of the world, but if you spend your time at home resenting the imposition your children are on you, you do not. You cannot have a heart for the gospel and a fussiness about your life at the same time. You will never make any difference there if you cannot be at peace here. You cannot have a heart for missions, but not for the people around you. A true love of the gospel overflows and overpowers. It will be in everything you do, however drab, however simple, however repetitive. God loves the little offerings. Given in faith, that plate of PB&J’s will feed thousands. Given in faith, those presents on Christmas morning will bring delight to more children than you can count. Offered with thankfulness, your work at home is only the beginning. Your laundry pile, selflessly tackled daily, will be used in the hands of God to clothe many. Do not think that your work does not matter. In God’s hands, it will be broken, and broken, and broken again, until all who have need of it have eaten and are satisfied. And even then, there will be leftovers. Rachel Jankovic is a wife, homemaker, and mother. She is the author of “Loving the Little Years” and blogs at Femina. Her husband is Luke, and they have five children: Evangeline (5), Daphne (4), Chloe (2), Titus (2), and Blaire (5 months). The good news — Maisey really truly seems to hear. I can’t wait until her appointment on the 12th. I don’t want to get my hopes up too much, but more and more people, including the doctors we saw today, agree that it is a strong possibility that she is able to hear out of her right ear. Today she took my phone because the music was playing and put it up to her right ear. It paused and she stopped and handed it to me and signed please. The bad news — Benjamin has a temp of 104+, his platelets are 28,000 and we now have an appointment with hematology in Iowa City on Monday. Poor little guy. Hopefully, we will still be able to do the cath on the 18th. Prayers are appreciated. Benjamin and Maisey are truly the sweetest kids. I can’t believe how much they love and trust us all ready. I get how much I love them. I’ve had a year to dream about them and to fall in love. Benjamin and Maisey have both had numerous blood draws and they are really angry while it’s happening, but as soon as it’s done they let me comfort them and they hug me so tight. It’s only been 2 weeks since we’ve been home. It hasn’t even been a whole month since we met and yet it seems like they have been mine forever. I truly don’t understand why I’ve been blessed but what a gift these two are. Maisey is so funny. She is just this petite little ball of fire. She makes about 100 different faces. My favorite is when she tilts her head and puts a palm on each cheek and just grins this huge grin at you. She knows she’s adorable. I remember when we talked about adopting her and how it would be to have people comment on her facial defects. I was worried about how to handle it and what I would say. But none of that has happened, everyone keeps talking about how cute and sweet she is. Don’t worry about what might happen because many times it never comes to be. You’d think I’d learn. Matthew 6:34 Therefore do not worry about tomorrow, for tomorrow will worry about itself. Each day has enough trouble of its own. I have a couple of drafts saved that I have been working on that talk about our trip and adoption, but I don’t seem to have a ton of time to just spend on the computer these days. First off, trying to keep everyone happy and fed is a major feat some days. Secondly, Benjamin has been pretty sick and we’ve had numerous doctors visits and lab draws. It turns out his blood work isn’t great and we had to postpone his heart cath until April 18th. His platelets were only 40,000. He bruises very easily and has had many bloody noses. We are trying to get all the blood work done, but they are trying to not make him anemic while doing said blood draws. They think it may be ITP – don’t ask me what it means. I’d just have to Google and copy and paste for you. So we’ll keep it simple and let you Google it. 🙂 It just makes things a smidge more complicated as we try to figure out what to do to make him feel better and to get his sats up. Have I mentioned lately how thankful I am for my husband? He has researched everything possible trying to figure out what it could be with Benjamin. He has consulted specialists, spent tons of time on the phone trying to get it figured out. He has reviewed AAP guidelines for international adoptions and what labs need to be done. It just makes me sad for other families who are just left hanging. It has made me think a lot about how this can be fixed. It’s just plain frustrating. On a slightly disgusting note, (this will be a TMI for most) I had to do stool samples for the kids. It was a first for me and not something I care to do anytime again. Praises to all the nurses who have to mess with everyone’s bodily fluids way too often in their line of work. No one gives you enough credit I’m sure. My hat is off to you for all that you do to care for your patients. But on to what this post is supposed to be about, Maisey hearing. Her actual appointment to get her hearing checked is April 12th. I do hope we get good news at this appointment. We truly do think she can hear some things. She responds differently than what we have been told a deaf baby will do. She says sounds that they usually don’t make and she isn’t monotone. I’m going to attach a video of her with Dan and the guitar. It was wonderful. Not sure if she was truly hearing it, but it seemed like it. It was a good, good day. Thanks again for all your prayers for our family and our two new ones. They are truly, truly a blessing. I cannot believe how well they have fit in with our family and how much they love the other kids already. I am truly blessed and grateful every day for the blessing of them in my life.